Our First Ever Opera Release! The Florentine Opera Company® brings American opera composer Carlisle Floyd’s operatic masterpiece, based on the classic English novel by Emily Brontë, to life. Floyd’s score takes you to the heart of Catherine and Heathcliffe’s devastating love story. Carlisle Floyd’s canon of operas is amongst the most performed by any living American opera composer, however four essential operas have never been commercially released. Wuthering Heights was first performed by Santa Fe Opera in 1958, but never recorded until now. With the composer acting as artistic advisor, this Florentine Opera premiere recording was made in January 2015 at the Sharon Lynne Wilson Center for the Arts, in Brookfield, Wisconsin. It features conductor Joseph Mechavich, soprano Georgia Jarman (Cathy), baritone Kelly Markgraf (Heathcliff), soprano Heather Buck (Isabella), tenor Vale Rideout (Edgar), tenor Chad Shelton (Hindley), mezzo-soprano Susanne Mentzer (Nelly), tenor Frank Kelley (Joseph), The Florentine Opera Chorus and the Milwaukee Symphony Orchestra. Reference Recordings is proud to release this exceptional recording. Carlisle Floyd, 90 years of age in June 2016, is still creating new operas (his newest, Prince of Players, was presented to great acclaim by Houston Grand Opera in March 2016), and is intent on having commercial recordings of all his operas released during his lifetime. 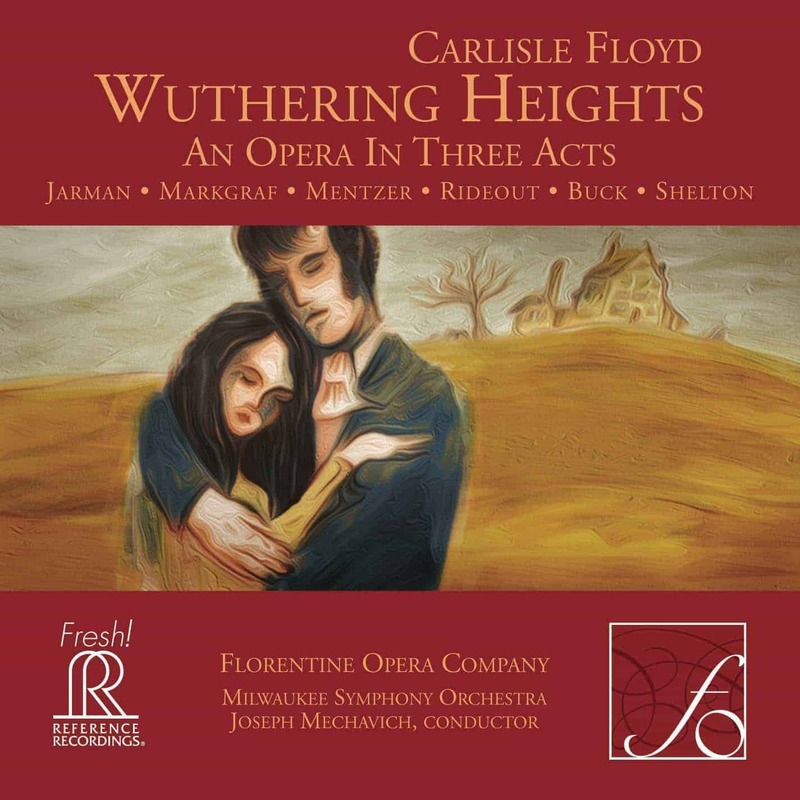 Describing the music of Wuthering Heights as highly dramatic and quite melodic, Floyd has said he is thrilled to have it recorded. The Florentine has released plans to follow Wuthering Heights with recordings of Floyd’s Willie Stark and Bilby’s Doll. Wuthering Heights was recorded and mastered by the team at Soundmirror, whose outstanding orchestral, solo, opera and chamber recordings have received more than 70 GRAMMY® nominations and awards. “For much of the work Floyd writes in an expressive parlando style that allows the words to be clearly heard even when the voices are competing with large orchestral forces. The dark brooding orchestral score is, even allowing for the tragic nature of the story, mellifluous and often lushly romantic in the style of Puccini and Samuel Barber as, for example, in Edgar’s aria “Then marry me Cathy and make me whole again” (Act 2 Scene 2 ) ardently delivered by tenor Vale Rideout. Floyd’s confident handling of his orchestral palette and his ability to create atmosphere is clear from the start where the doleful horns that open the work immediately capture the bleakness of the North Yorkshire moor setting.